In this Continuing Education program, Roger will teach you what the TRUE fundamentals of Putting and Chipping are, and what you need to know - and do - to save shots on, and around, the greens. From the grip to the stance, to reading greens and visualizing your chips and putts, Roger will take you step by step to a better short game. 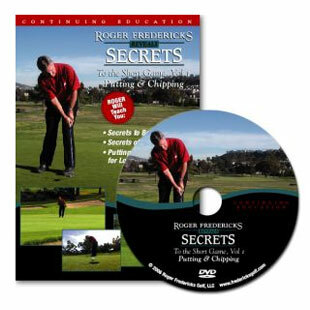 If your Putting and Chipping isn't up to "par" and you're wasting shots on and around the greens, "Roger Fredericks Reveals Secrets to the Short Game, Vol 1 Putting and Chipping" will teach you how to reverse that trend and enjoy a better short game for a lifetime.